Just found that there is play in the rivets holding the steel ring with the spider together. 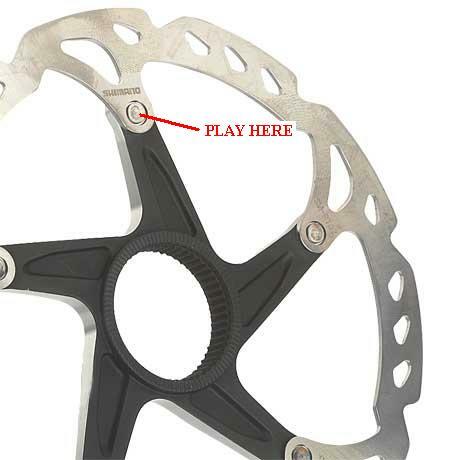 It´s the rear 160mm XTR rotor (see pic) I can feel it clearly when rocking the bike back and forth with the brake locked. The rivets have play. Being honest, other than the creacking noise when braking, I haven´t found any performance lost. But it´s really annoying. Anyone had this happen? Is there a fix, or shall I look for a warranty replacement? You can try to drip a small amount of teflon lube around the rivets/carrier and see if it quiets down. Otherwise... warranty. Lightly grease the centerlock splines and make sure the adapter is tightened down. If you actually have movement at the rivets, you need to replace the rotor. A large portion of the strength of that connection is from the friction between the spider and rotor. You have lost that friction if there is movement and are now relying on the shear strength of the rivets. These were not engineered like a "floating" rotor. Last edited by gmcttr; 12-15-2009 at 09:11 AM. Isn't that the high performence version with floating rotors??! I didn´t think about that.Thanks gmcttr, rotor is already back for warranty replacement.